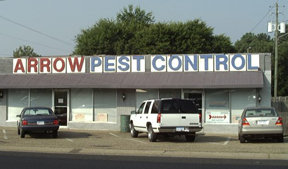 Arrow Pest Control began in 1967, when Marion Bowen opened the first office in Prattville. When Arrow Pest Control began, there were only 6,600 residents, and now Arrow Pest Control has "grown" with the town. The company has become one of the largest independent pest control companies in central Alabama, doing business daily in Prattville, Millbrook, Montgomery, and the surrounding areas. Marion's son, Terry Bowen, joined the business in 1981. 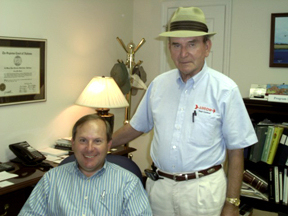 Together the father-son duo has almost 70 years of experience in the pest control industry. This year Arrow Pest Control becomes a Three Generation Company as Terry's son, Greg, joins the family business. Throughout the years, the company has updated and modernized its procedures to provide the best service possible.Arrow Pest Control was one of the first companies in the nation to use Sentricon® bait system for treating termites. In fact, Arrow Pest Control was a test company for Sentricon®, and served as part of an advisory group to Dow Chemical Company in the development of this revolutionary form of termite treatment. Arrow Pest Control is large enough to provide quality service in all areas of pest and termite control, while still maintaining a small town family atmosphere. Terry's sons, Greg and Paul, have begun working summers in the business, just as their father did, so now there are three generations of the Bowens serving this community in this business. Both Marion and Terry have served in various community positions, such as the Chamber of Commerce, the Prattville Water Board, Boy Scouts, the Kiwanis Club, the Exchange Club, and First Baptist Church. They consider this kind of service a way of giving back to the community that has done so much for them, their family, and their business.